I have a love-hate relationship with valve-lash adjustment. I love adjusting anything mechanical: getting my hands on it and fine tuning it to perfection. The part I dislike about lash or free play adjustment is its awkwardness and complexity. Too many components have to be removed to perform a ten-minute task. For this reason, I like engines with hydraulic valve lifters that, for the most part, require no adjustment. However, when adjustment is necessary, instead of setting lash, as you would with solid or mechanical valve lifters, a hydraulic system requires preload as there is no lash. This is usually required only when the cylinder head is being reinstalled. The camshaft is responsible for the valve’s timing and its lift as well as its duration—the periods it remains open and closed. 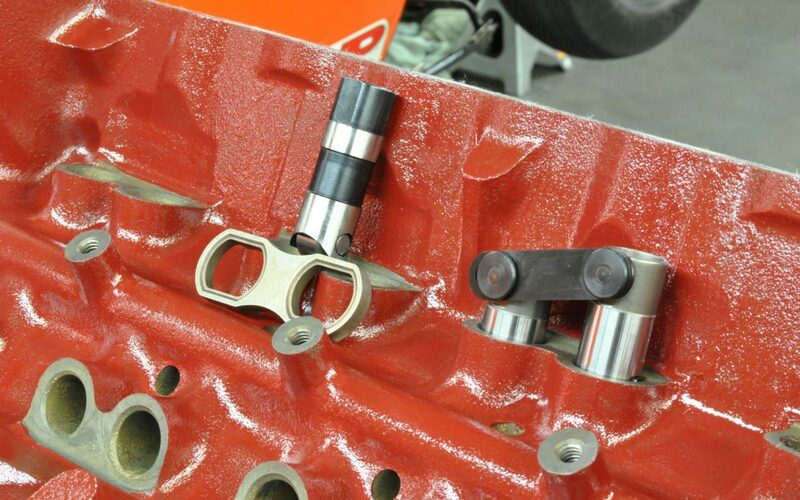 In a cam-in-block engine, this is accomplished by the camshaft working with intermediate components: valve lifter (or tappet), pushrod, and rocker arm. With an overhead cam design, the intermediate components differ, using some style of follower in lieu of a pushrod and possibly a tappet. 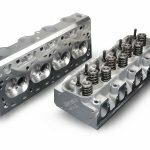 This discussion focuses on the hydraulic tappet employed in cam-in-block engines. 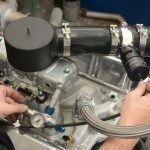 It’s the profile of the camshaft lobe that determines the valve action, and that motion is first transmitted to the valve lifter and onto the pushrod and finally the rocker arm that contacts the stem of the valve. When the parts are cold, they shrink and as heat is generated they expand. For this reason, free play is required to prevent parts binding when heated. Free play is created between the rocker arm and the valve stem tip. Valvetrains that required lash were often identified as employing a solid lifter or mechanical camshaft. Today’s engines provide either a hydraulic or mechanical lifter, based on the manufacturer’s decision. Improvements in metallurgy and valvetrain design now allow a mechanical tappet to stay in adjustment much longer and work efficiently with less operating clearance or lash. Often these are referred to as a tight-lash design. When the engine is cold, operating clearances recede and when hot they expand, depending upon engine materials. 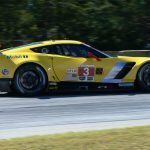 If the engine block and heads are entirely of cast iron, expansion will be minimal. Alternatively, if they are of aluminum, expect expansion because aluminum expands twice as much as steel—and both lifter and pushrod are made of steel. Aluminum block and heads will increase the lash 0.010in – 0.020in cold to hot. In addition, the lash setting means that the effective valve lift is less than the height of the cam lobe. This is the result of the multiplicative effect of the rocker arm ratio, which is the offset of the fulcrum from the rocker mounting. For example, if the cam lobe is 0.350 inch and the rocker arm ratio is 1.6:1, the valve lift would be 0.350 X 1.6 = 0.560 inch, if the engine used a hydraulic lifter, which has no lash. However, if it were a mechanical design with 0.020-inch lash, then the valve lift would be 0.540 inch. This decrease may sound inconsequential, but it represents approximately six percent less valve travel and a corresponding impact on air flow both in and out of the cylinder. Furthermore, as the parts wear from constantly colliding as the lash reduces, the performance of the engine degrades and emissions output is altered. Also, it’s a false impression to assume a solid lifter camshaft makes more power than a hydraulic design. A solid lifter has the potential to follow a more aggressive camshaft lobe and also work effectively at higher engine speeds. 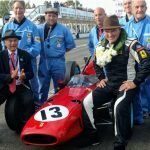 But racing engines aside, this argument is irrelevant. For our discussion a solid lifter is as its name implies: one piece of metal. 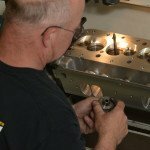 It can be considered simply a means to transfer camshaft lobe action to the pushrod. In contrast, a hydraulic lifter is hollow, has an internal piston, spring, and allows oil to enter and exit. Similar in operation to the hydraulic piston of a tractor bucket, engine oil flows to the cavity in the hydraulic lifter. When the valve is closed the lifter is on the base circle of the cam (the round part of the lobe) and its cavity fills with oil. The internal piston is now at its maximum travel upward since the oil is below it. As the camshaft rotates and opens the valve, the piston is forced down and a check ball is usually employed to close the oil inlet orifice. 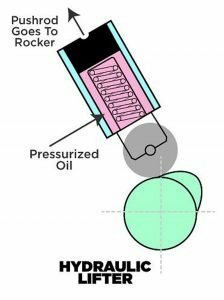 As oil is considered incompressible, the piston cannot move because oil is trapped below it and the bottom of the cavity. The tappet now operates as a solid lifter and transfers the motion from the camshaft lobe to the pushrod. 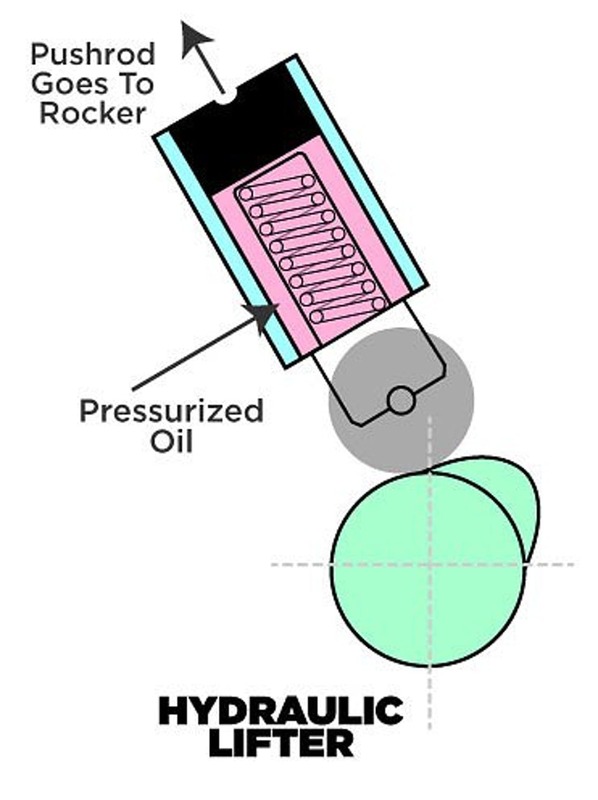 During the lift of the camshaft and due to valve spring pressure, oil is forced from the lifter cavity by the time the lifter dwells on the nose of the lobe. Once the travel of the lifter on the lobe is complete, the pressure from the pushrod is decreased on the piston and it enters its at-rest position. The cavity is now replenished with oil. 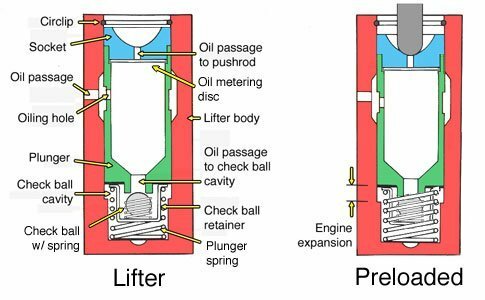 If an engine with hydraulic lifters is noisy, either the internal spring has lost some tension or the check ball is not sealing or allowing the oil to fill the cavity. The remedy is to replace the tappet. By changing the engine oil regularly and avoiding over-revving the engine, hydraulic lifters will work as designed indefinitely. Most hydraulic lifters fail due to poor maintenance. 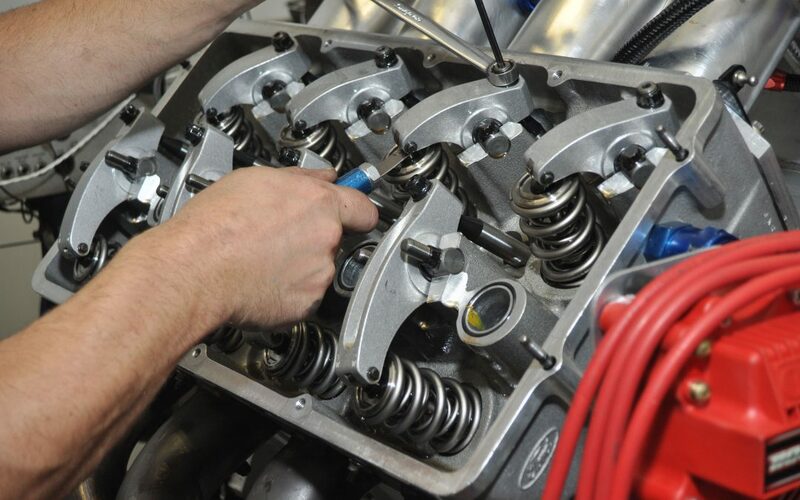 To determine which lifter is noisy, remove the valve cover, start the engine, and let it idle. Anticipate oil spray: take precautions. Then, using a long extension 3/8-inch drive, push down gently on the rocker arm where it connects to the pushrod. This will absorb some of the internal piston slap in the lifter and should change the sound. Due to the effort required to replace a failed lifter, it’s wise to renew all of them. If one is worn the remainder will soon follow. Also, during starting, avoid dry lifters operating against camshaft lobes by coating their bottom surfaces with engine assembly lubricant before installation. Some engines use a threaded nut on the rocker stud to adjust preload while others place a shim under the rocker stand. In further designs employing a rocker shaft, adjustment is self-regulating if the valve installed-height is correct and pushrod of the proper length. Regardless of the design, a good rule is to rotate the pushrod between your fingers and when rotation is no longer possible, correct preload has been achieved. If a stud-mounted rocker is used, add one-quarter rotation to the nut once the pushrod preload is established.